Disconnect.me, maker of an Android privacy app banned from the Play store, has filed an antitrust complaint with the European Commssion accusing Google of abusing its dominant market position. The complaint could add fuel to an ongoing European Union antitrust investigation of Google's business practices. 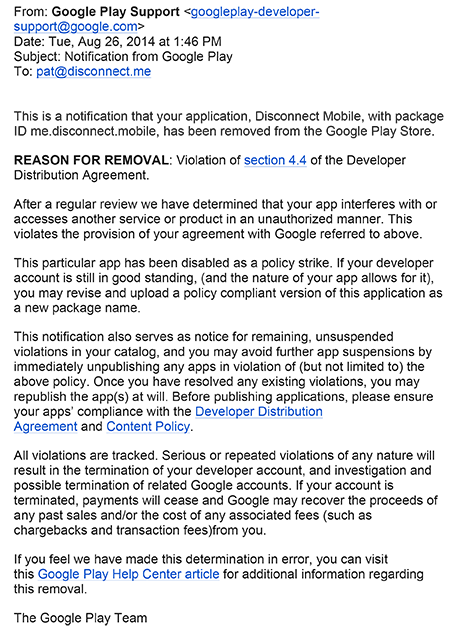 Google banned the Disconnect Mobile app last year, saying it violated its developer distribution agreement. 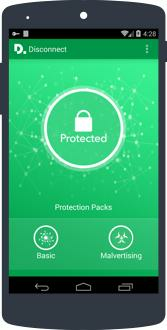 Disconnect Mobile routes traffic through an encrypted Virtual Private Network (VPN) tunnel, which makes it harder to track users. By installing a special network profile, the app also blocks ads, tracking services and suspected malware sites, both inside apps and in Android's browser. This however violates Google's developer rules that state that apps should not interfere with or disrupt other apps, Google told the company when it banned the app. Disconnect found Google's reasoning "vague and overly broad," and thought Google felt the app threatened its tracking- and advertising-based business model. As a result, Disconnect charged Google with abusing its dominant market position by banning the app. A European Commission spokesman said the Commission had received the complaint and will assess it. The app maker alleges that Google unfairly discriminates by favoring its own privacy and security software, limiting access to competing software, the Wall Street Journal reported, adding that this prevents Europeans from using other privacy software. "This reported claim is baseless," Google said, adding that its Google Play policies have long prohibited apps that interfere with other apps. App makers are not allowed to let their apps alter the functionality of others or remove their way of making money, Google said, adding that these policies are uniformly applied and with them there are currently over 200 privacy apps available in Google Play. The developer's complaint against Google could add to the Commission's probe into the Android operating system it launched in April. That investigation is still ongoing, and should determine whether Google violated EU antitrust rules by bundling its own apps with Android, the Commission said. Android users running Android 4.0 and higher can still install the banned app by downloading it directly from Disconnect's website. The company also offers similar apps for iOS, Mac and Windows.